Sometimes your phone gets too laggy to be usable and you just want it back to the state when it was new; or you just forgot your password. In the case on an iPhone 5, you hard reset it. Here’s how you can hard reset your iPhone 5. You can follow these steps as closely as possible but in the case of further damage to your smartphone: both hardware and software, is solely your responsibility. Backup important data to a separate storage, (external or to the cloud); make sure your device is charged up at least 60% before performing a hard reset. Let Sydney CBD Repair Centre Team do it for you! Connect your iPhone 5 to the computer while still powered on. Turn off your iPhone 5 completely while connected to the computer. Press and hold both the HOME and the POWER buttons for 10 seconds. If you see the iTunes logo with the lightning connector below it release the POWER button. Continue holding the HOME button until you see a confirmation on your computer that your iPhone was detected in Recovery Mode. Release HOME button when dialogue box for Recovery appears on your computer. Confirm the dialogue box that you see on your computer and wait while iTunes restores your iPhone 5. IMPORTANT: Be careful not to disconnect the iPhone while the operation is running. Make sure that the computer is fully charged or plugged in to a backup power source to prevent further damage due to interrupted reformatting. When reformatting and resetting was successfully completed, set up your iPhone 5 using SET UP AS NEW IPHONE. Safely remove your iPhone 5 from your computer when setup is complete. Click the button to learn more about the features of the new iPhone 5. 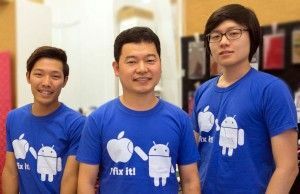 Let the Sydney CBD Repair Centre Team help you reset your iPhone 5! We specialize in Screen Replacement services.